Drove through town in deep winter watching a jogger run in place at the light, ear buds under his hat. It is a long light. He stops running and begins to play air guitar. Then the light changed and we all went back to what we were doing. Driving out to the river, looking for signs of life in the snow covered fields where corn was growing just months ago, I'm sure there's gotta be kale. There is a bumper sticker that people have that simply says, "I Love Kale!" 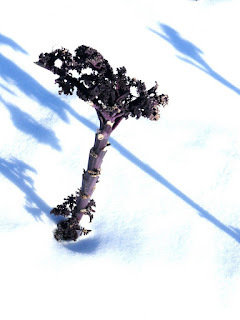 If you cook it right, the humble, wrinkled kale plant is pretty tasty and of course it is one of the only plants that are edible that is the last one standing in winter. You can go out in 19 degree temperature, pick some kale and bring it in to the house. It is hearty, like New Englanders. Cut greens up into rough "jullienne" or strips. 2-4 T pure olive oil in large sauce pan or skillet. (You can use extra virgin but it is not necessary and can turn bitter if overheated). Heat under low heat until surface is just starting to shimmer (approx 300F). Add 2 cloves coarsely minced garlic and cook slowly until just starting to caramelize (getting slightly tan). Add onions and "sweat" (slow saute) until getting translucent. Add Greens, stir & cover. Sweat greens until quite limp. Uncover and increase heat to evaporate any water or juices quickly. Add 2-4 Tbs of Chef Myron's Magic 20 Gauge Marinade and stir fry until sauce is glazed on and a bit "tightened." The latest news on the sale of 47 acres in Florence to the City of Northampton stands to benefit those who vote with their mud boots. 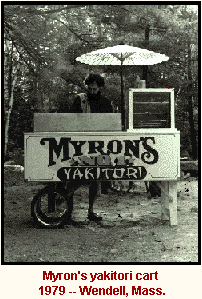 On December 28, 2009, The Historic Commission voted 6-1 meeting to endorse preservation of the Bean Farm primarily for agriculture, according to an e-mail sent by Grow Food Northampton, a grass roots organization dedicated to local food security. The sellers of the farm, the Bean Family, have requested a deadline from the City of Northampton of early February to decide whether or not to purchase the property for an agreed upon sum of $910,000. It has been on the market for over a year. Farmers aren't the only factions interested in the property. The Grow Food Northampton e-mail also announced that farm experts have banded together to advise the City's Agricultural Commission. The group consists of Michael Docter, Food Bank Farm founder, Dan Kaplan of Brookfield Farm, Phil Korman, Executive Director of CISA, Ben Grosscup of NOFA and 3 others. Members of Grow Food Northampton will be at Winter Fare on Saturday, January 9 in Northampton to raise awareness about the cause. More about the organization can be found at the Grow Food Northampton website. For documentation on the Northampton Planning Department's interaction with the Bean Family family and others, as well as upcoming meetings, visit the Office of Planning website.